What kind of electric car batteries are people actually using now, and why? Answer: Golf cart batteries, mostly. I went to austinev.org's large collection of electric vehicles (1200+ as of today) to find out why these are so popular - and it's because golf cart batteries are cheap, reliable, long-lasting, and available everywhere. And yes, you can even find them on the freeway! "Floodies" are by far the most popular battery type (and yes, most of our floodies are actually golf cart batteries, repurposed). Why? Primarily because they're cheap, but also because they're available in a lot of different configurations, sizes, and shapes, and VERY widely accessible. You'll also hear this one called the vented, wet, or unsealed battery, to distinguish it from the other lead-acid battery types. This means you keep adding water to it now and then, and that it will vent (exhale) small amounts of hydrogen and oxygen gas into the air when it charges. 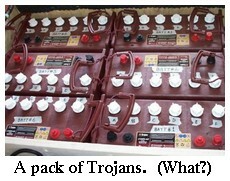 Examples of the flooded lead-acid battery include the Trojan batteries (T-1275 12 volt batteries or T-875 8 volt batteries), and the US-125 from US Battery. The AGM (Absorbed Glass Mat) lead-acid battery is the best quality lead acid battery you can buy; it's the latest, best technology of an old, reliable battery chemistry. A little more expensive, but longer-lived (4-7 years) and safer than the flooded kind. 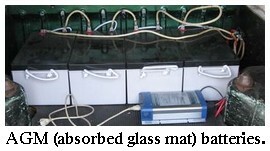 What's absorbed glass mat technology about? ...seal it up and remove the need to keep filling it with water, along with the possibility of spilling acid all over yourself and your car (and venting explosive gases), add cycle life and the ability to charge a little faster without ruining it, and you'll have arrived at AGM technology. It uses a fiberglass-like mat to hold the electrolyte liquid in place rather than just gooing it up with thickener as the gel batteries do (scroll down a little to read about gel golf cart batteries). 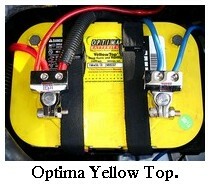 Examples of the lead-acid AGM battery include Optima golf cart batteries (yellow-top), Hawker golf cart batteries (16XE or 2150), and the Champion GNB batteries. If you want detailed information about AGM batteries, see Northern Arizona Wind and Sun's FAQ page. 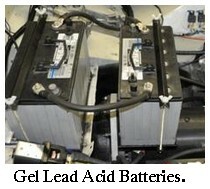 Gel lead acid batteries (or gelled, same thing) are also sealed rather than vented, with silica gel added to the electrolyte to keep the liquid from sloshing around. Note that these require a special charger (slower and lower voltage than AGM or flooded golf cart batteries use) to prevent damage. See Northern Arizona Wind and Sun's FAQ page again for details on this. 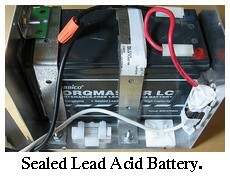 Examples of the lead-acid gel battery include the Deka golf cart batteries (like the Dominator 8G27 and 8G31) and others. So which golf cart batteries are SLA and VRLA? SLA (easy to confuse with SLI, the starting-lighting-ignition battery that cranks the Chevy) means Sealed Lead-Acid, and is commonly used to mean "any lead-acid battery you don't have to keep filling with water". The really smart people will point out that no lead-acid battery is truly "sealed", because the charging process makes them (all) exhale a bit of hydrogen and oxygen gas, which has to go somewhere! The best lead-acid golf cart batteries encourage the gases to join up and pop out water molecules, so not much of it lingers around to cause trouble - unless you accidentally overcharge. VRLA means "valve-regulated lead-acid", meaning it's got a valve on it that maintains a little positive pressure all the time, so it stays sealed unless there's an honest-to-goodness gas-venting emergency. It's just better technology, but the same thing. Get your batteries wired up in series or parallel, depending on what you need (more voltage or more amp hours). Faster than a speeding club car? ...you can still burn rubber with lead acid batteries. 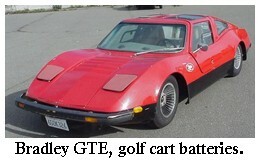 Check out these electric sports cars!